Sophia was giving out bottles of water to protectors holding down the space when she was shot with a concussion grenade. This was the response of police and DAPL mercenaries as she and other brave protectors attempted to hold the line against the black snake in hservice of protecting our water. As of last night, we found out she was air lifted to County Medical Center in Minneapolis were she’s currently undergoing extensive, hours-long surgery from injuries sustained from the blast. Please consider donating to help pay for her treatment. We must to support our comrades when they need us the most. She needs all of us right now. After all she is our family. My name is Michael Basillas, I live in NYC. Sophia Wilansky is a fierce friend of mine. We've known each other for almost a year now from participation in various demonstrations focused in the city. 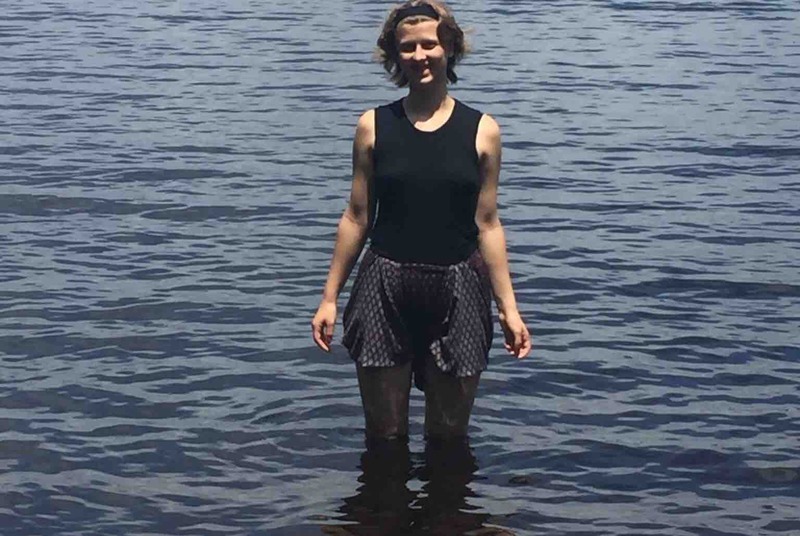 Sophia and I share passion addressing social justice, vigilance, and resistance , and understanding this world is unsuitable and required drastic change. 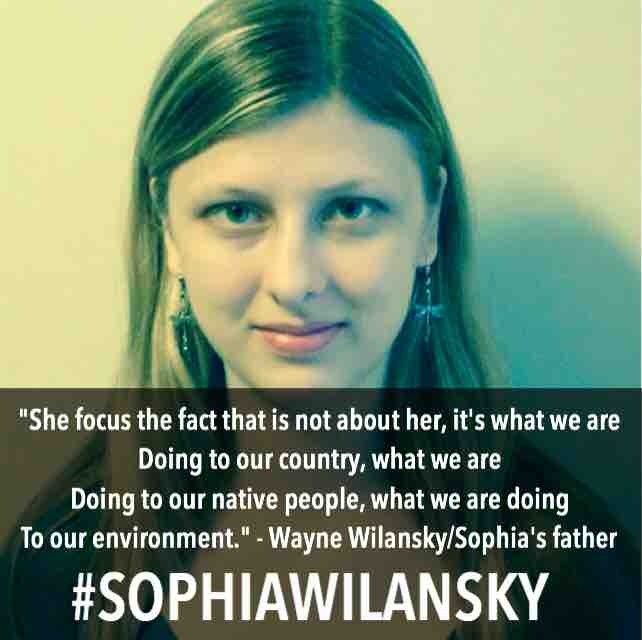 Sophia is family to many affinity activism groups from The Base, NYC Shut It Down, and HOODS4JUSTICE. I'm this money with the help of several other people to provide medical relief funds after what had happen on Nov 21, 2016. Funds raised in this campaign will go directly to provide financial aid towards 20 surgeries Sophia needs to save her arm. Funds also provide Sophia's father some financial support to take care of his daughter. Their insurance will not cover all of the expenses and can only cover a certain percentage of it especially with this type of surgery. So we are asking to donate gracefully because this will help provide financial support toward Sophia's long recovery. $20,000 will be used from GO FUND ME to be used as a financial cushion for both the father Mr Wayne Wilansky and Sophia for the next several days. The rest of the money will be delivered to Mr. Wilansky when he gets back one in NYC. #sophiawilansky is doing well. 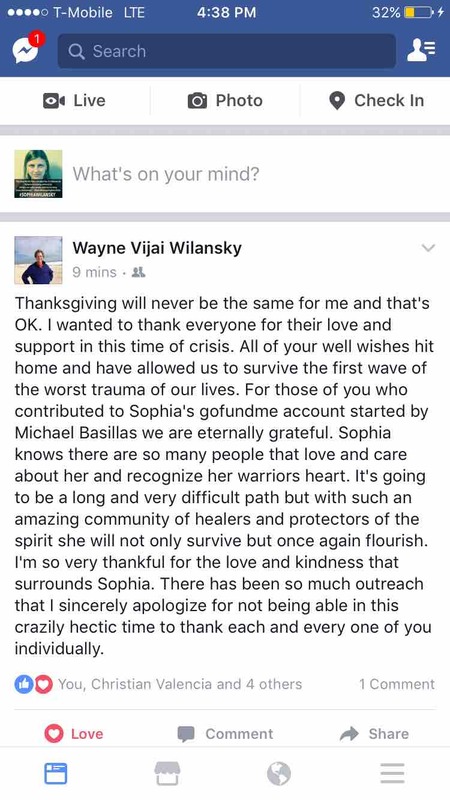 If you like to get further updates on sophia please check out the Facebook Community page at https://m.facebook.com/SophiaWilanskySupport/. They frequently post information about Sophia's well-being. Thank you for the support you have given us. Thank you from #sophiawianksy father. Sophia said not a word to those police. She stood in silence. She was sanding to close to a truck and they didn't like that. I suppose an unarmed, unarmored young woman is threatening to them. They ordered for her to retreat, the whole time shooting rubber bullets. When they finally stopped, she attempted to retreat, as they ordered. She took a few steps towards us, and that's when they directly launched the flash grenade at her. It exploded right on her. I want people who are not here to understand, we assemble in PEACE. Sophia said not a word to them. She is the proof that they will use violent tactics no matter what. We are not to blame here. Anyone who would blame the people and not the government in this situation astounds me... Wilansky family, please contact me. I am a witness to what Morton County did to your daughter. I just did the math and gofundme will make just over $20,000 off of the donations to this woman. I think it's beautiful for everyone to help but that is a lot of money and maybe we can petition for them to donate their fee to her medical bills. It would be an estimate of half a million dollars if she needs a prosthetic arm. A prayer for the good Sophia Wilansky tonight. May she recover more beautifully than could be imagined. May she know the love of thousands. May all her old ones enfold her now. May her story wake up the hearts of tens of thousands. May the protectors and the waters they protect be kept safe from harms way. It is good to see all those donations. Sorry for my skepticism. I should have researched better. Keep up the good work! Some serious North Dakota pipeline trolls (police and pipeline supporters) on here trying to stop this campaign. They are just jealous they don't have this kind of support. And the police will be looking at serious charges against them for crimes against humanity. Thank you all water protectors for the fight. Sending troops in to back you up and lots of them. Keep upping the goal as you hit it so that folks can continue to donate. Sheila is going to need a lot more than $100 - $200k for care, extensive hospital stay, months and months of rehab and a prosthetic. Amazing what people can do when united. Prayers for her healing. And for a good attorney. This needs to be taken to court. I wrote Obama and sent pictures of Sophia's arm telling him what the police are doing is an act domestic terrorism! I also wrote to Amnesty International USA and the United Nations with complaints! My prayers go out to Sophia and family, and to the 300 water protectors who were also injured! Water is Life! We are praying for all of you as you face the future. The sacrifices that this young woman made to be there to support an important cause will be with her the rest of her life. She chose to stand up, she chose to help others that were in need that night and ended up getting severely injured. The least we can all do is come together and support her in her recovery. Her physical, emotional and mental state are fragile at this time and in need of lots of support to assist her. I don't know her personally but thank her from the bottom of my heart. I love that so many folks are pulling together and showing so much love and support. Let's keep this momentum going and make sure all her expenses are covered. We are in this together and together everyone achieves more. It is unfortunate that so many people feel the need to spead misinformation. Earlier today the pro-dapl movement was out in droves trying to say the photos of Sophia weren't real and that it was a "2014 Montana Bear Attack", now all of a sudden it's valid, but she "did it to herself"? Please. When will you realize that the people you are trying to protect care nothing for you? Water is life. Let's try to do better and be better. Best wishes for Sophia and her family. Please help her with any amount. She was just passing out water and helping This gotton of control when this girl could loose and an arm or hand. The violent use police are doing is wrong. This has to stop before more people get hurt. Solidarity from Britain, Sophia. Thank you. Victory to the protectors. May the true spirit of the Lord bless and comfort you. I have been praying for Ms. Wilansky every single day. I never knew of this campaign. Still praying for a complete recovery to a brave person.